Home FBRI What is the Forest Biometrics Research Institute (FBRI)? The Forest Biometrics Research Institute (FBRI) is a non-profit public research corporation dedicated to sustainable and scientifically based forest management. The Forest Biometrics Research Institute is a research, development, service and education organization in the field of forest inventory, forest growth and forest planning. Structured to serve the forestry profession and specifically forestry organizations in all Western States. Quantify treatment effects on biodiversity and landscape diversity. The Institute originally filed Articles of Incorporation and Bylaws for the State of Montana, it received corporate 501(c)3 tax-exempt status from the IRS and non-profit status within the State of Oregon as a research corporation. The Institute has filed and received copyright and trademark rights to the name, “Forest Biometrics Research Institute” from the US Patents Office. These steps ensure identity and longevity of the Institute, its mission and security of its endowments and funds. The report is available from the National Academy Press in Washington, D.C. as International Standard Book Number 0-309-08456-3 and contains 144 pages. FBRI was formed in 2002 by James D. Arney, unware that the National Research Council had produced a report. A recommendation in that report identified the need for a “center of excellence” being established to renew the commitment to forestry R&D. The mission of FBRI is to fill that need within the science of forest biometrics. Much of the current riparian, wildlife and social regulations applied to forest management are based on belief rather than fact or well-grounded field research. These regulations put serious financial constraints on working forests by limiting the range of silvicultural options deemed acceptable. Harvest capacity is reduced and operational acres are restricted. Only ongoing forestry R&D investment may provide a counter or contradict these attacks on active forest management practices. 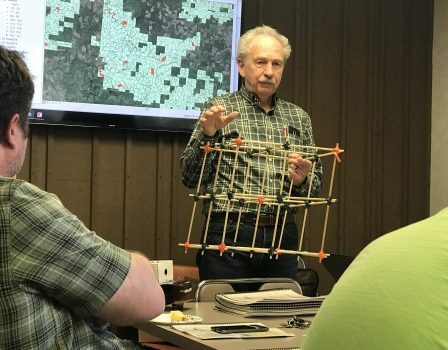 Only FBRI is actively pursuing and providing a mission of ongoing and new field research and felled-tree studies into site, tree taper, silviculture and growth modeling for active working forests. a) Who currently maintains and provides a fully-integrated forest management software and database package – FBRI and ??? b) Who currently maintains, reviews and updates site curves, taper models and growth models on a regular basis – FBRI and ??? c) Who currently provides ongoing technical support to the forestry profession – FBRI and ??? d) Who currently maintains the largest, most diverse (species, silviculture, regional) research database – FBRI or ??? e) How many alternative forestry R&D organizations exist with the primary mission to support the forest industry – FBRI and ??? A consulting organization may provide assistance to apply current technologies where a land management organization has no internal professional staff. An R&D service organization maintains, reviews, improves and provides the most reliable and defensible basis for active decision-making on working forests.